In the mid-2000s a bevy of young, female singers, including Ashlee Simpson (1984–) and Hilary Duff (1987–), comfortably dominated the music charts. The youngest member of the growing pack was a supreme talent out of Massachusetts named Joanna Levesque, better known to fans as JoJo. Belting out tunes since she was two years old, JoJo caught the attention of industry executives and celebrities with her unusual vocal range and mature song-stylings. Her self-titled debut album, which included a unique blend of soulful ballads and catchy dance tunes, zoomed up the charts throughout 2004. Her hit singles, "Leave (Get Out)" and "Baby, It's You," received constant airplay on the radio and MTV. Both the album and JoJo received a slew of award nominations, and the singer broke a number of records, including becoming the youngest solo artist after Stevie Wonder (c. 1950–) to have a number-one hit in the United States. Joanna Noelle Levesque (pronounced luh-VEK), better known as JoJo, was born on December 20, 1990, in Foxboro, Massachusetts, a tiny town with a population of less than fifteen thousand, located in the outskirts of Boston. The Levesque home was filled with music: JoJo's father was a blues singer, and her mother, Diane, had a background in musical theater and was a church soloist. One of the teen's earliest memories is watching her mother perform in the choir and practice hymns at home. As she told Know Your World Extra, "I just listened and learned." At the age of two JoJo was already imitating her mother's incredible range; she also imitated the singers she heard on her parents' stereo, an eclectic mix that included the rock group the Beatles, the "Queen of Soul" Aretha Franklin (1940–), and legendary jazz artist Ella Fitzgerald (1918–1996). As a result, JoJo sang nursery rhymes, but with a very different twist. "I would do riffs on them," she explained to Know Your World Extra, "and make them jazzy." JoJo's life changed when she was four years old and her parents divorced. She went to live with her mother in a one-bedroom apartment and the pair often struggled to make ends meet. Diane Levesque took on cleaning jobs to make sure that her daughter would not go without, but the young singer always felt different from her friends, who seemed to have so much more. In just a few years, however, she would use those early memories to pen one of the songs on her first album.
" Age is just a number." road from Boston. She wowed the show's producers, who immediately gave her a spot. The tiny six-year-old faced a packed studio audience and fearlessly belted out an astonishing rendition of Aretha Franklin's "Respect." The show's host Bill Cosby (1937–) was practically speechless and members of the audience gave JoJo a thunderous round of applause. Not long after, the little girl with the powerful voice received a phone call from executives of The Oprah Winfrey Show, asking JoJo to appear on an upcoming episode. Thanks to the endorsement by talk show host Oprah Winfrey (1954–), offers began to pour in for JoJo to appear on various television programs and to perform at an assortment of live venues, including a Boston Celtics basketball game and the Republican National Convention. Her big break, however, came in 2003 while performing on America's Most Talented Kids, a televised talent program that showcased entertainers under the age of fifteen. A member of the audience introduced her to Vincent Herbert, producer and owner of Da Family Entertainment, who signed the teen songstress to a recording contract with Blackground Records. Just a few months after her thirteenth birthday, JoJo traveled with her mother between New York, Miami, and Los Angeles to record tracks for her first album. She had the opportunity to work closely with well-known Blackground producers as Soulshock … Karlin, Mike City, and The Underdogs, who had been previously associated with established performers including Whitney Houston (1963–), Ruben Studdard (1978–), and Aaliyah (1979–2001). "Everyone had such an incredible vibe," JoJo explained on her Web site, "and that comes through in the songs." When discussing her studio experience, however, JoJo's less serious side also tended to creep into interviews. As she told Danielle Oberdier of Time for Kids, "It's fun working with producers because we have secret handshakes and we eat junk food and it's like family." In addition to singing on the album, JoJo wrote three of the tracks: "Yes or No," "Sunshine," and "Keep On Keepin' On," which the young singer claims is her favorite. "Keep On" may be her favorite because it deals with growing up poor but still knowing there is hope. In her interview with Oberdier, JoJo opened up and explained how she came to write the song: "I was sitting by the pool where I live now, thinking 'Well, I didn't always have a pool to sit by. It wasn't always good like this.' So I was thinking that it can't be bad for so long, because I grew up poor. Things will get better soon so you have to Keep On Keepin' On. " The remaining songs on the album are an eclectic mix of soulful ballads, such as "Use My Shoulder," which show off JoJo's five-octave range; party jams like "City Lights"; and catchy pop numbers like "The Happy Song." JoJo insisted that the variety was intentional and that the CD would appeal to listeners of all ages. In interviews she bristled at being labeled a pop princess and adamantly denied that her album was intended just for teenagers. "I am not doing bubblegum pop," she told Know Your World Extra. "This is real music that is not just for young kids or for older people. It is for everybody." When JoJo's self-titled album was released on June 24, 2004, it received mixed reviews, with most critics commenting understandably on the tender age of the singer. Chuck Arnold of People observed that the thirteen-year-old "has yet to really grow into her big voice," and that "she may still be a little young to play with the big girls." But, he also noted that "she's no average JoJo," and that the first single released from the album, "Leave (Get Out)," with its "sassy girl-power lyrics" was truly a guilty pleasure. Raymond Fiore of Entertainment Weekly offered up a similar review. While he criticized JoJo for her over-the-top deliveries, he also commented that her CD was "brimming with sizzling hooks" and that the songstress "exhibited remarkable promise." JoJo became the youngest solo artist after R…B sensation Stevie Wonder to have a number-one hit in the United States. Music Award for best new artist—she was the youngest performer ever to receive a nomination. Following her album's release, JoJo was off and running on a whirlwind of interviews, concert dates, and television appearances. She was the opening act for Usher (1979–) during his summer 2004 European tour, and later in the year she performed with Bow Wow (1987–) on Steve Harvey's Big Time, schmoozed with guests on Live with Regis and Kelly, and sang before a presidential audience on TNT's "Christmas in Washington." JoJo also made a brief appearance on the NBC drama American Dreams, portraying a young Linda Ronstadt (1946–). In addition she made time to record the song "Secret Love" for the soundtrack to the animated feature Shark Tale. 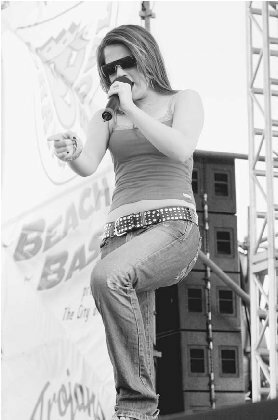 When JoJo released her self-titled debut CD in June 2004, another teen singer-songwriter named Maria Mena hit the music charts with her first U.S. album. Although Mena was Norwegian and five years older than JoJo, the two shared a number of similarities. Maria Viktoria Mena was born on February 19, 1986, in Oslo, Norway. Like JoJo, both her parents were musically inclined. Her father, Charles, was a drummer in a band and her mother was a playwright. Music was such a part of the Mena household that Maria and her brother Tony were named after the main characters in the musical West Side Story. Mena's parents split up when she was very young, which had a very traumatic effect on the nine-year-old. She developed an eating disorder and became severely depressed, turning to her diary to write down her feelings. When Mena was thirteen years old she went to live with her father and, as part of her therapy, he helped turn some of her diary entries into lyrics. One of them ended up being a song called "My Lullaby," which captures the pain the young girl experienced as her parents were divorcing. Mena begged her father to let her record. Seeing that his young daughter exhibited an amazing maturity and talent, Charles called some of his contacts in the music industry to make a demo (a sample recording). He then shopped the demo around, and the sixteen-year-old Mena was signed by Sony Music, who felt that her powerful vocal stylings were similar to Canadian pop singer Alanis Morissette (1974–). Mena's first album, titled Another Phase, was released in 2002 in Great Britain, where it rose to number nine on the U.K. charts. "My Lullaby," which appeared on the album, became a number-one hit. In June 2004 Mena landed on the American charts when her second album, White Turns Blue, debuted in the United States. With her "bare-it-all" lyrics and teenage-angst appeal, critics called her a combination of Morissette, Fiona Apple (1978–), and Tori Amos (1964–). According to Raymond Fiore of Entertainment Weekly, Mena was a new force to be reckoned with, claiming "she's got hooks you could hum for days." she is doing. As she explained in a Kidzworld interview, "That passion and that drive just keep me going. If I didn't want to do this, it would be a different story." One big change is that instead of attending regular school JoJo is homeschooled by a tutor supplied by the School for Young Performers. Her favorite subjects are social studies (because she likes learning about different cultures) and some science, but she lamented to Danielle Oberdier, "math is just my enemy." Like many young female singers, JoJo made the leap from music to movies in February 2005 when shooting began on her first feature film, Aquamarine. The movie is based on the novel of the same name written in 2001 by American writer Alice Hoffman (1952–), and centers on two teenage girls who find a mermaid in their beach club's swimming pool. Before filming had completed, JoJo had already signed on for a second movie, this time a comedy called R.V. starring veteran actors Robin Williams (1941–) and Jeff Daniels (1955–). Music, however, remained JoJo's first love, introduced to her by her family and fostered by her mother, Diane. JoJo remains very close to her mother, who is also her manager. "Even though you feel like you can do anything when you're a teenager," she told Kidzworld, "you still need your parents." JoJo remains humble and realistic when it comes to her age and admits that she has a long way to go. As she wisely remarked to Know Your World Extra, "I think that as you grow and your audience grows, you have to change and evolve." Arnold, Chuck. "Review of JoJo. " People (July 19, 2004): p. 41. Fiore, Raymond. "Review of JoJo. " Entertainment Weekly (June 25, 2004): p. 162. "JoJo: At Thirteen Years Old, the Singer Is Making a Name for Herself." Know Your World Extra (November 5, 2004): pp. 12–15. "Interview: JoJo" Kidzworld.com. http://www.kidzworld.com/site/ p4436.htm (accessed on August 23, 2005). "JoJo Debut CD Is Bling Bling." TeenMusic.com (November 13, 2004). http://www.teenmusic.com/d.asp?r=84065…cat=1020£ (accessed on August 23, 2005). "JoJo: Don't Call Me Baby." BBC Radio News: Chart News (November 3, 2004). http://www.bbc.co.uk/radio1/news/chartnews/ 041103_jojo.shtml> (accessed on August 23, 2005). Oberdier, Danielle. "Get to Know JoJo." TimeforKids.com (July 2, 2004). http://www.timeforkids.com/TFK/kidscoops/story/0,14989, 660897,00.html (accessed on August 23, 2005). Official JoJo Web Site. http://www.jojoonline.com/main.html (accessed on August 23, 2005).